Special Containment Procedures: Colonies of SCP-831 are to be contained in an observation chamber with ceiling, walls and floor having Vickers hardness of at least 1000 kg/mm sq. The containment chamber is to be regularly inspected; any damage - even a scratch on the floor - is to be reported in accordance with Procedure 831-C. Nutrients introduced into chamber are to be poured on the floor and not contained in any kind of vessel. Personnel entering chamber for any reason are to be equipped with Class-T armor, and subject to thorough inspection before and after entry to ensure that no foreign objects are introduced into the chamber nor are any specimens of SCP-831 inadvertently removed from the chamber. Populations of colonies of SCP-831 in containment are not to exceed the limits prescribed in Document 831-2155AE. Nutrients are to be withheld and specimens are to be destroyed as necessary to keep colony populations within these limits. Colonies of SCP-831 encountered outside of Foundation containment are to be immediately eradicated. Individual organisms of SCP-831 can easily be exterminated by fire, crushing, asphyxiation or many other methods. However, sufficiently advanced colonies of SCP-831 can be expected to have constructed defense mechanisms. After eradication, objects found in colony’s location are to be brought to Site-36 or Site-181 for analysis. Description: SCP-831 is a species of tool-using insect-like organisms superficially resembling wingless worker-caste Reticulitermes flavipes. Colonies of SCP-831 have been collected or eradicated in eleven locations in eastern and central North America to date, in locations ranging from Texas to Ontario. The organisms appear to be capable of feeding on most organic material, with a preference for cellulose and sugars. Mature specimens range from 7 mm to 1.2 cm in length. Individual specimens appear to have a lifespan of 25 to 40 days. Unlike true termites, SCP-831 does not appear to be divided into castes with distinct morphology; all specimens are essentially “workers” and all females are capable of breeding with an extremely short gestation period. SCP-831 is a highly social organism and is found in colonies. The upper bound of the colony size is not yet known; the largest colony investigated by the Foundation to date consisted of at least eight million individual organisms. Individual organisms of SCP-831 do not exhibit intelligence beyond simple survival instincts. The colonies of SCP-831 that have been identified to date were located in (or originated in) dark, enclosed urban locations affording shelter, access to nourishment, water and materials appropriate for the construction of SCP-831's tools. In most cases, the colony was discovered in the basement, attic or walls of a home or other structure. 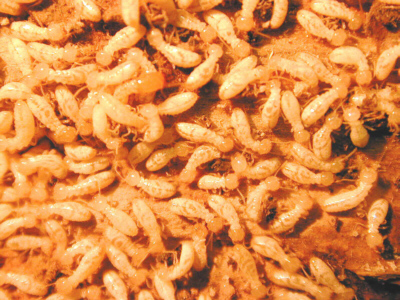 If a colony is located within a structure, the colony will not consume the wood cellulose to an extent that would compromise the structure’s appearance or structural integrity. The organisms flee from light and their behavior suggests an instinct to avoid detection or observation by humans or predators. 01@00:00 Commencement of observation of chamber containing approximately 1000 specimens of SCP-831. Chamber is airtight, consisting of painted steel walls, floor and ceiling (15 cm thickness) and C8-rated observation window. Chamber is unfurnished except for commode, three steel buckets respectively containing wood pulp, sucrose solution and water. 01@13:08 Personnel D-334 enters chamber to top off contents of steel buckets. Prior to this time, specimens had not engaged in activity other than feeding on wood pulp and sucrose solution, and breeding. D-334 inadvertently fails to retrieve steel paper clip that falls from her shirt pocket while refilling buckets. 01@13:09 A number of specimens of SCP-831 advance toward the paper clip, then carry it to a corner of the room where specimens of SCP-831 commence altering it. 01@13:43 Paper clip is repurposed as scraping implement. Specimens commence scraping floor and walls of chamber and retreiving metal and paint filings. 01@23:26 Scrapings result in a small pile of metal filings (no more than 10 grams). 02@00:00 Due to reproduction, chamber observed to contain approximately 2,500 live specimens of SCP-831. 02@16:04 Size of piling of metal filings estimated at approximately 400 grams. Paint chips and scrapings are accumulated in separate pile. Some specimens of SCP-831 observed to engage in mastication of metal scrapings and paint scrapings. 03@00:00 Chamber observed to contain approximately 5,000 live specimens of SCP-831. 03@01:23 Pile of scrapings is a mound approximately 11 cm in height. Metal scrapings have been moved to the interior of the pile of paint scrapings. 03@21:24 Pile of scrapings continues to increase in size as specimens continue to transport metal and paint fragments to it. Activity in the interior of the pile of paint scrapings is unobservable, but thermal imaging indicates the presence of a heat source within (presumably friction or body metabolism of SCP-831). 04@00:00 Due to reproduction, chamber observed to contain approximately 12,000 live specimens of SCP-831 (excluding any that may be obscured from view in the interior of the pile). 04@08:10 Personnel D-334 enters the observation chamber at the direction of Dr. Garcia and intentionally scatters the pile of paint and metal scrapings. Pile is observed to contain at least 1,000 specimens of SCP-831 and eleven metal objects, some of which are similar to the original scraping implement and some of which resemble picks and chisels. One of these instruments is retrieved. Analysis shows that the instrument, a sharp metal cone approximately 1 cm in length, 1 mm maximum diameter, is composed of the same metal as the metal floor scrapings. 04@13:44 Specimens begin to chip ceramic from commode in observation chamber, using previously documented instruments. 05@00:00 Chamber observed to contain approximately at least 22,000 live specimens of SCP-831. The pile of paint scrapings has been reconstructed. 06@00:00 Chamber observed to contain approximately 40,000 live specimens of SCP-831. 06@13:23 Containment breach of [DATA EXPUNGED] at Site-36 interferes with observation for approximately 122 minutes. Upon re-commencement of observation, the steel buckets and the commode in the chamber are missing. Dr. Garcia directs that from this point forward, wood pulp, water and sugar solution that are introduced to the containment chamber are to be spilled on the floor rather than contained in a vessel. 07@00:00 Chamber observed to contain approximately 100,000 live specimens of SCP-831. 07@11:15 Personnel D-334 enters the observation chamber at the direction of Dr. Garcia and intentionally scatters the pile. Pile is observed to contain a rudimentary crucible, a small mechanism resembling a lathe, and other objects of indeterminate function. There are several deep holes bored into the floor of the chamber. Dr. Garcia orders the reinforcement of the ceiling, walls and floor of chamber with additional layers of steel and concrete. 08@00:00 Number of specimens in chamber is estimated at approximately 240,000 live specimens. Containment chamber contains several mounds of varying sizes consisting of scrapings and the bodies of living and dead specimens. 09@00:00 Number of specimens in chamber is sufficient to fill the chamber to a depth of approximately 2 cm, although specimens are unevenly distributed. Although observation of the colony's implements is problematic due to the number of specimens, there is evidence of a number of crucibles and forges, calibrated for different temperatures, a number of lathes in various sizes, and taps and dies. Chamber also contains a spool of approximately 40 meters of narrow gauge steel wire. 09@15:30 Specimens construct bellows, glassblowing equipment, and several objects of unknown function. 10@00:00 Number of specimens in chamber is estimated to be at least 400,000. 10@03:20 Personnel D-334 enters chamber at direction of Dr. Garcia and intentionally attempts to disturb large mound of specimens with wooden rod. Apparatuses referenced at 09@15:30 are demonstrated to be airguns with flechette-shaped ammunition. D-334 is struck several times in the head and neck and collapses, following which specimens swarm over D-334. Dr. Garcia directs that the body remain in the chamber and that the delivery of wood pulp, sucrose solution and water cease. 10@23:25 Electrical failure in observation chamber deactivates lighting and prevents observation for approximately 35 minutes. 11@00:00 Number of specimens in chamber is estimated to be at least 600,000. Upon restoration of lighting, body of D-334 is missing. A textile blanket, apparently constructed of human hair and fibers from D-334's uniform, covers several mounds within the observation chamber, obscuring them from view. 11@15:54 Personnel D-118 and D-536 enter chamber at direction of Dr. Garcia with directions to remove the blanket. D-118 and D-536 are wearing body armor. D-118 suffers painful electrical shock upon touching the blanket and retreats. D-536 successfully removes blanket and both personnel leave the chamber. Colony is observed at this point to have constructed numerous items of glassware, several basins filled with various liquids and solid matter, several inflated bladders containing unknown gasses, objects resembling machine tools, and various other objects of indeterminate function. Specimens appear to be engaged in the construction of lens-grinding and chemical refining equipment. The blanket, upon analysis, contained concealed wiring and small batteries. Foundation personnel are investigating how batteries of that size could generate the observed voltage. 11@21:23 Lighting fails in observation chamber. Subsequent analysis shows that the lighting failed due to an electrical short generated from within the chamber. Observation is prevented for approximately 18 minutes. 12@00:00 Number of specimens within chamber appears to have stabilized at approximately 800,000. Upon restoration of lighting, much of the colony is obscured from view by an igloo-shaped ceramic shell. Thermal analysis indicates that the colony has constructed a number of internal combustion engines running on unknown fuel. Analysis of objects within chamber indicates that several objects within the chamber, of indeterminate function, are composed of alloys containing copper, zinc, tin, nickel and lead, which are not present in the chamber's walls but which may be found in electrical wiring and piping in the facility, or which may have been on D-334's person. Dr. Garcia directs additional reinforcement of the chamber's integrity, and extermination of any specimens of SCP-831 found outside the chamber. 12@15:53 Personnel D-054, wearing body armor and appropriately equipped, enters chamber with sledgehammer at direction of Dr. Garcia with directions to break ceramic shell and expose its contents. D-054 is attacked by "several fast-moving flying objects" and retreats without damaging the shell. D-054 is also struck by several flechettes which fail to penetrate his armor. Upon analysis, the flechettes are found to be coated with a corrosive substance containing unknown enzymes. 12@23:25 Lighting in the chamber fails again, for 22 minutes, apparently due to electromagnetic pulse generated from the interior of the chamber. When lighting is restored, observation is obscured due to the application of an opaque lacquer-like coating to the interior of the observation window. 13@04:05 Personnel D-033, wearing body armor and appropriately equipped, enters the chamber at direction of Dr. Garcia with directions to scrape the coating from the window. D-033 is advised not to disturb the ceramic shell. Approximately 3 minutes after entering the chamber, D-033 is immobilized by a flypaper-like substance and anesthetized, apparently by means of intravenous injection. Before observation is again obscured by reapplication of the coating (apparently by means of a sprayer located above the observation window), observation indicates that specimens are engaged in the purification of wafer-grade silicon and the construction of complex electronics. Radio signals emanating from within the chamber are detected and recorded. 13@22:06 Lighting in the chamber fails again. Specimens are in the process of applying an opaque and sound-insulating gel to the observation window when Dr. Garcia orders the termination of observations due to concerns that SCP-831 may have escaped containment. Specimens in chamber asphyxiated and remains incinerated. Remainder of Site-36 inspected, and specimens of SCP-831 found in adjacent chamber isolated. Objects found in containment chamber are undergoing analysis. These objects include, among many other objects of indeterminate function: the ceramic shell, a hole-boring machine with carbide drill bits, a number of vacuum tubes, a motor rated at approximately 55,000 watts, an argon gain medium, precision lenses and other laser components, several hexagonal printed wire boards with chemically etched circuitry, glass vessels of various substances including nitroglycerin, acetone, FMOC-D-Alanine, and 5 Amino 1H Tetrazole (5-AT), an apparatus apparently used to synthesize crystals, a cyclotron, and an apparatus resembling a microwave telecommunications broadcasting tower, with a broadcasting antenna pointing upward. Chamber is evacuated except for the installation of a microwave receiver in the chamber, tuned to the same signal as the presumed broadcasting tower. Remains of D-334 and D-033 are not recovered but DNA analysis identifies that many of the objects in the room are composed, in part, from their remains. 128@14:03 Microwave receiver in chamber receives signals from an unknown source. Signal was recorded and is undergoing analysis.